We’d love your help. Let us know what’s wrong with this preview of Lexie by Audrey Couloumbis. Ten-year-old Lexie used to love going to the shore. For as long as she can remember, she's spent every summer there with her parents, eating hamburgers, swimming in the ocean, and combing the beach for treasure. This summer is going to be different though. Lexie's Mom and Daddy are divorced, and for the first time Mom won't be there. To make matters worse, Daddy has a sur Ten-year-old Lexie used to love going to the shore. For as long as she can remember, she's spent every summer there with her parents, eating hamburgers, swimming in the ocean, and combing the beach for treasure. This summer is going to be different though. Lexie's Mom and Daddy are divorced, and for the first time Mom won't be there. To make matters worse, Daddy has a surprise—his new girlfriend, Vicky, and her two sons are coming to stay with them for a week! Now Lexie has to share her house with perky Vicky, Vicky's moody teenage son Ben, and messy three-year-old Harris. The little beach house just doesn't seem big enough for so many people. Is there still room for Lexie? To ask other readers questions about Lexie, please sign up. I don't usually read too many middle grade novels anymore, but when I found myself with a copy of Lexie in my hands, I jumped on the chance to read a story about a young girl who's summer plans with her father lead to unexpected surprises. Lexie was a great, young protagonist who immediately grew on me right away. Her parents have recently divorced and it's her first summer vacation away from her mother at her father's beach house. She's an avid reader (yay! ), so she's already planned her summer I don't usually read too many middle grade novels anymore, but when I found myself with a copy of Lexie in my hands, I jumped on the chance to read a story about a young girl who's summer plans with her father lead to unexpected surprises. Lexie was a great, young protagonist who immediately grew on me right away. Her parents have recently divorced and it's her first summer vacation away from her mother at her father's beach house. She's an avid reader (yay! ), so she's already planned her summer books to bring along and hopes to have some fun combing the beach with her Dad. And when you learn that she's not going to get some alone time after all, and that her Dad has decided to invite his girlfriend and her own two children along without saying a word to her... your heart does a little flip and plummet like Lexie's. You can quickly understand her point of view and why she's less than thrilled to be sharing her Dad with people that are practically strangers to her. Her hurt feelings and her Dad's clueless behaviour to the situation will have your heart reaching out to her. And perhaps because she's only ten, she does lack the bitterness that might have been expected from a character in a YA novel and is willing to at least make the best of the situation. This is a week for Lexie where she'll find more hidden treasures than the ones simply found on a beach... just maybe, she'll come to form new friendships and learn that family can be found in different forms. Confession: I only read this book because the cover art is so darn cute! I know. I feel so ashamed to admit it, but it's true (as they say the first step is acceptance). And I'm damn glad that I listen to my superficial eyes because this book is so good. I love everything about it, especially Lexie. I really love Lexie as a character and how she handles herself with "adult" problems. She's a pretty brave and mature 10 yr. old - quite admirable, really. I know that if my parents divorce and they t Confession: I only read this book because the cover art is so darn cute! My favorite part of the book is when (view spoiler)[Lexie and Ben discovers the sand shark in a little puddle swimming around and how they both try to dig a canal to bring the shark into the ocean again. (hide spoiler)] I really like how their relationship grew within a few hours and really understand each other in a different sense. In a way they're both the same - both are going through divorce,and ultimately both are afraid, in a way, to lose their parent to the "stranger", in their eyes. Considerations or precautions for readers advisory: Content is perfect for a young child whose parents are going through a divorce. Review citation: Stevenson, D. (2011). 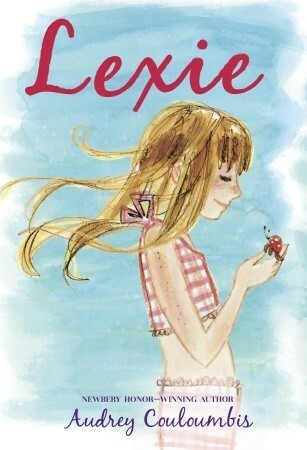 Lexie (Book Review). Bulletin Of The Center For Children's Books, 64(10), 462-463. While not great, this is a book that I liked. I enjoy the writings of this Newbery honor award winning author. It is a simple tale told well of Lexie who is ten and trying to understand her father. Believing she and her father will be going on vacation to their New Jersey beach house together, she is stunned to learn that her father did not tell her his girlfriend and her two children would be vacationing with them. Ten years old and precocious, Lexie can gauge the difference in personality of the While not great, this is a book that I liked. I enjoy the writings of this Newbery honor award winning author. It is a simple tale told well of Lexie who is ten and trying to understand her father. Ten years old and precocious, Lexie can gauge the difference in personality of the girlfriend and her mother. While her father is loving, he is also very self absorbed. While significantly different from each other in many ways, Audrey Couloumbis's Jake and Lexie do share a certain similarity in style. Both books are remarkably simple, relying on authentic, ordinary characters to live out a story worthy of being told, a story that unfolds as naturally as one would expect it to in real life. There's not a lot of flash to Lexie, but there certainly is substance, and emotionally receptive young readers will find that author Audrey Couloumbis understands pretty we While significantly different from each other in many ways, Audrey Couloumbis's Jake and Lexie do share a certain similarity in style. Both books are remarkably simple, relying on authentic, ordinary characters to live out a story worthy of being told, a story that unfolds as naturally as one would expect it to in real life. There's not a lot of flash to Lexie, but there certainly is substance, and emotionally receptive young readers will find that author Audrey Couloumbis understands pretty well what it's like to be a kid. Lexie's home life isn't a mess, but it's not perfect, either; her parents have divorced in the recent past, and this summer will be the first that she and her father spend at their vacation house by the sea without Lexie's mother. There are adjustments to be made in Lexie's life, but she's willing to try, even as hard as it might be to go to the sea without her mother this summer. Lexie is a good girl who wants to make things as easy as possible on everyone, including herself. There are a few unexpected surprises to be had during the trip, though. While driving on the way there, Lexie's father tells her that his new girlfriend, Vicky, will be joining them this year, which could end up making the adjustment even harder for Lexie. What's more, Vicky's sons Ben (age fourteen) and Harris (three) will be along for the trip as well, increasing the number of strangers that Lexie has to learn to cope with on her vacation. It's going to be a summer of change, but Lexie can take some solace in the fact that the biggest change of all, her parents' divorce, is already behind them. With that painful break over and done with, most of what comes after is about healing old wounds and learning how to begin a new kind of life. What makes Lexie's summer with her father and his girlfriend's family compelling for us to read about is the minimal scaffolding from which the story hangs. There's really no need for explosive secrets or plot twists in a simple tale of two broken families cautiously coming together to form a potential new brood, not better than the ones they were part of before, but maybe someday worthy of being cherished in its own way. The hypersensitive emotions of imperfect people still carefully feeling their way together, certain to trigger resentment in each other at times and not all sure if they even really want to make a go of getting the arrangement to work, is compelling reading in its own right, without further adornment. What separates Lexie from most other such novels is the unfailing humanity of every one of its characters, all of them quite able to make major blunders in their dealings with each other. It's not just the kids who step on each other's toes, either; Lexie's father and Vicky are just as prone to making mistakes in relation to each other and their kids, as well as each other's kids, so we don't feel as if any of the characters are possessed of superhuman wisdom or relational acumen. They're all just people, no more and no less than that, and readers are invited to celebrate the sum total of their strengths and weaknesses. It's easy to love Harris; who, despite his habitual noisemaking that would drive some people up the wall, happens to be a bright, inquisitive and affectionate child that anyone would be lucky to know and have in their lives. Ben is much more reticent than his little brother, occasionally sullen and disposed to creating awkward situations between the two families, but his moments of goodness are unmistakable, and his general tolerance of Harris's toddler behavior is admirable. Lexie finds herself caught between trying to do right as a surrogate sister to the two boys and enjoying her vacation at the sea for all that it has meant to her in the past, and she also has to be careful in what she says and does around her father and Vicky during this ticklish time when their families are just getting to know each other. The summer will surely be an unforgettable one for Lexie, as she tries to figure out how to let some things go and how to move on with her own life while so much about her family is still in transition. One of my favorite parts of this book is when a slightly mean remark that Ben makes causes his brother Harris's spirits to fall, and even though the boy is but three years old, Lexie gives him the sincerity of regard to realize why he's bothered by what Ben said. "I'd only known Harris for a day but I knew he didn't like it when somebody made being a little kid the same thing as being stupid. I didn't like it either." I'm with Lexie on this one, big time. I don't know how often I hear people―not just teenagers, but adults, too, and sometimes even other kids―talk about children who are younger than themselves as if being young were some kind of a mental disability that will wear off when they get older, when they know enough to shed their "silly ways" and become more like the person speaking. As I see it, toddlerdom simply has its own set of smarts, not lesser than those of older kids or adults, just different. They have their own innovative thinkers and philosophers and humorists among them, and I think that Harris, like so many real toddlers, qualifies as all three. I, too, was such a toddler, so my empathy is especially keen. In a world that doesn't always pay sincere attention to the very young, Lexie offers Harris not just a few moments of attention, but her very real friendship, a gift that means more than all the sand dollars and crabs from the shore that she could dig up in ten trips to the sea. That Lexie is a smart girl in her own right. 2011, Realistic Fiction, novel. Lexie has some major life changes occurring as she goes on vacation with her dad, and his new girlfriend. She always grew up going with the whole family but now that her parents are getting divorced some adjustments are having to be made. What will this new vacation look like for Lexie? Very relocatable book and would be a great suggestion for a student who is in Lexie's shoes. This review has been hidden because it contains spoilers. To view it, click here. Loved this book when I was younger, felt very connected to the protagonist. It was almost like ready my own life!! Could book to teach kids how to cope with a divorce situation. Lexie is ten years old, and this is the first year that Lexie's mom won't be joining Lexie and Daddy at the beach house for vacation. That's because, at the end of the summer last year, Lexie's parents got divorced. Lexie lives with her mom, but she spends weekends with Daddy, and she's looking forward to having a whole week with him, at the beach. Then Vicky shows up, and Lexie didn't even know Daddy was dating her, or that Vicky was coming to the beach, let alone that Vicky and her two sons wo Lexie is ten years old, and this is the first year that Lexie's mom won't be joining Lexie and Daddy at the beach house for vacation. That's because, at the end of the summer last year, Lexie's parents got divorced. Lexie lives with her mom, but she spends weekends with Daddy, and she's looking forward to having a whole week with him, at the beach. Then Vicky shows up, and Lexie didn't even know Daddy was dating her, or that Vicky was coming to the beach, let alone that Vicky and her two sons would be spending the entire week with them. Couloumbis, A. (2011). Lexie. New York: Random House. Lexie's summer vacation to the shore is very different this year, since her parents are divorced. Still, she looks forward to spending the week with her father. However, Lexie's hopes are shattered when she realizes her father has invited a few other people to stay at the beach house for a week: His new girlfriend Couloumbis, A. (2011). Lexie. New York: Random House. Lexie's summer vacation to the shore is very different this year, since her parents are divorced. Still, she looks forward to spending the week with her father. However, Lexie's hopes are shattered when she realizes her father has invited a few other people to stay at the beach house for a week: His new girlfriend and her children. This novel develops slowly, and has very little action. The majority of the plot occurs through nuanced conversation. The author does a great job of capturing the varying emotions that the characters are feeling, but I felt that the story moved too slowly. I would use this book in the classroom to teach students how to read and write dialogue and characterization. This book would be a good choice for a unit on change or family. Many students will be able to relate to the characters in the novel, even if they aren't particularly moved by the plot. This book is about a little girl whose parents have recently been divorced. She is used to going to her beach house on the Jersey Shore with both her mom and dad. This year she is only going with her dad, and he has invited his new girlfriend are her two kids. Lexie isn't happy about this and barely knows them when she finds out that her dad is engaged to the woman. This book doesn't have a movie to go with it. I personally thought that the book could have gone on longer. I was kind of sad when This book is about a little girl whose parents have recently been divorced. She is used to going to her beach house on the Jersey Shore with both her mom and dad. This year she is only going with her dad, and he has invited his new girlfriend are her two kids. Lexie isn't happy about this and barely knows them when she finds out that her dad is engaged to the woman. This book doesn't have a movie to go with it. I personally thought that the book could have gone on longer. I was kind of sad when it ended, but I am that way with a lot of books. Some scenes in it did seem less important and kind of a waste of time, but it was still an interesting book. The shore has always been one of ten-year-old Lexie’s favorite places in the world. She would spend the summer there with her parents, playing on the beach, finding treasures in the sand, and reading picture books. Now though, her parents are divorced. So her mother isn’t going to be going to the shore at all. Lexie is spending a week there with just her dad. Or so she thinks! On the way there, her father announces that his new girlfriend will be joining them, and her two sons too. Lexie is push The shore has always been one of ten-year-old Lexie’s favorite places in the world. She would spend the summer there with her parents, playing on the beach, finding treasures in the sand, and reading picture books. Now though, her parents are divorced. So her mother isn’t going to be going to the shore at all. Lexie is spending a week there with just her dad. Or so she thinks! On the way there, her father announces that his new girlfriend will be joining them, and her two sons too. Lexie is pushed out of her usual bedroom into one that is as tiny as a closet. Teenage Ben is also not enthusiastic about being stuck together. Little Harris is messy and doesn’t even want to head outside at first. As the two families try to live together, Lexie discovers that connections can be created over the smallest things and that there is still room for everyone even if the house is a lot more crowded. What a great book for anyone going through a divorce, for children and parents. Lexie is about to spend her first summer at the beach house without her parents together. Mom is staying at home and Dad is taking her to the shore. Lexie is surprised when she realizes it will not be just the two of them, but Dad;s new girlfriend, and her two boys, Harris and Ben. Lexie feels like she is being pushed aside and replaced. This is such a good book for anyone in this situation, adults too. I think Lexie What a great book for anyone going through a divorce, for children and parents. Lexie is about to spend her first summer at the beach house without her parents together. Mom is staying at home and Dad is taking her to the shore. Lexie is surprised when she realizes it will not be just the two of them, but Dad;s new girlfriend, and her two boys, Harris and Ben. Lexie feels like she is being pushed aside and replaced. This is such a good book for anyone in this situation, adults too. I think Lexie's voice is very true to how this feels for children going through a divorce and being faced with a "new family." She is resentful, but curious. Also, I liked how this book described Ben's feelings as well. It shows the other side of the new grouping and how he is trying to cope as well. This is an endearing story about 10 year old Lexie who is dealing with her parents' divorce. Lexie always goes to the shore every summer with her parents, but this time she's going with just her dad. She thinks her and her dad will be spending time alone, but dad has other plans. Unexpectedly, Lexie is spending her vac Couloumbis, A. (2011). Lexie. New York: Random House. Ten-year-old Lexie is headed off for a week at the shore--a trip she's made with her parents many times before. This trip, though, is the first since her parents got divorced. Lexie thinks it's just going to be her and her dad for the week, but soon learns that her dad's girlfriend, Vicky, and her two sons, toddler Harris and fourteen-year-old Ben, will be joining them. Throughout the week, Lexie is forced to get to know Vicky, Harris, and Ben--by sharing a small house, playing in the sand, and Ten-year-old Lexie is headed off for a week at the shore--a trip she's made with her parents many times before. This trip, though, is the first since her parents got divorced. Lexie thinks it's just going to be her and her dad for the week, but soon learns that her dad's girlfriend, Vicky, and her two sons, toddler Harris and fourteen-year-old Ben, will be joining them. Throughout the week, Lexie is forced to get to know Vicky, Harris, and Ben--by sharing a small house, playing in the sand, and rescuing a stranded shark. This book is pretty simple but can appeal to girls and boys in the middle grades. The beach setting makes the book fun and relaxed, especially as it allows for encounters with sea animals. The family structures can appeal to kids with divorced parents. It is a good introduction to talking about ocean habitats and wildlife. Reminded me a bit of Junonia--girl gets unpleasant surprise when she gets to her annual beach vacation--but this surprise involves her own dad's plans to marry a woman with two boys, who are suddenly staying in the middle of her first vacation with her dad since her parents' divorce. Ouch! Hard to believe a parent could be that clueless, but he was "waiting for the right time" to tell her. Anyway, this got a bit belabored for me, but kids who are dealing with these issues will identify, and Coul Reminded me a bit of Junonia--girl gets unpleasant surprise when she gets to her annual beach vacation--but this surprise involves her own dad's plans to marry a woman with two boys, who are suddenly staying in the middle of her first vacation with her dad since her parents' divorce. Ouch! Hard to believe a parent could be that clueless, but he was "waiting for the right time" to tell her. This book is about a girl whose parents are divorsed. She goes to spend the week on the shore with her dad only to find out that her dad has invited his new girlfriend. Lexie is mad because Vicky and her two sons (Ben and Harris) are staying too. Her father gives her bedroom to the boys so Lexie gets the smallest room. Her mom knows nothing about Vicky staying and Lexie doesn't know how to tell her. So Lexie trys to be nice but her father isn't spending any time with her. This was a very interes This book is about a girl whose parents are divorsed. She goes to spend the week on the shore with her dad only to find out that her dad has invited his new girlfriend. Lexie is mad because Vicky and her two sons (Ben and Harris) are staying too. Her father gives her bedroom to the boys so Lexie gets the smallest room. Her mom knows nothing about Vicky staying and Lexie doesn't know how to tell her. So Lexie trys to be nice but her father isn't spending any time with her. This was a very interesting book and I hope you will like it too. Lovely soft, sweet story about Lexie, whose parents divorced last year and now her dad is surprising her with company at their shore house. The time that Lexie was looking forward to spending with her dad is now time that she is spending with her dad's new lady-friend, Vicky, and her two sons, Ben and Harris (goes by Mack). Good book to give to a 10-year-old girl who is getting used to step-siblings. I read this book with my seven-year-old. This was the first longer chapter book she was willing to listen to, so she obviously thought this story was interesting. This book took place at a vacation home along the beach, and I think the descriptions of the beach adventures probably kept her attention the longest. It was a nice take on the dynamics of a family healing from a divorce and the issues that go along with introducing the dating partners of parents. This is a great book. Lexie is having a hard time with her dad. There is a lot of fights between them. There is some news that her dad has not told her. This upsets Lexie a lot. I recommend this to people who like realistic and beach stories. If you are looking to find something interesting try this book. This is written by award winning author Audrey Coulombis.This book has won the Newberry Book Award!Please read this!!!!!!! This is a great book for kids to read. Lexie's parents recently seperated. Lexie is going on summer vacation with her dad. Lexie is so excited to spend time with her dad. But when she gets there, she finds her dad invited another woman and her kids. Dad doesn't explain the arrangement to Lexie but she is slowly figuring it out. Lexie thinks her vacation is ruined. For the first time, Lexie's mom will not be coming to the shore with Lexie and her father. Not sure how she feels about this, Lexie is even less happy that Dad has invited his girlfriend and her two sons to join them. It is a week of changes big and small, and life with two boys is definitely a new experience. This is a very positive book on dealing with the changes that divorce can bring. Lexie is planning a great week at the beach with her father even though it is their first time since her parent's divorced. She is understandably surprised and upset when she discovers on their arrival that Dad has invited his new girlfriend and her two boys to join them. Lexie handles the awkward situation with much more grace and poise than any ten-year-old I've ever met. “When Ben came back to me, he said, "Why are you laying with your face in the sand?"